Wrinkles around the collar can make even the nicest shirts, jackets and dresses look horrible when worn without ironing them out. It doesn't matter if you're wearing Dolce and Gabbana or a Walmart brand t-shirt; wrinkles make you look as though you plucked your clothes from the hamper instead of the closet. Fortunately, wrinkles and crinkles can easily be removed using a variety of everyday household items. Find and read the label on your clothing item to determine the type of material it is made from. Plug in and set your iron to the setting that matches the clothing material. 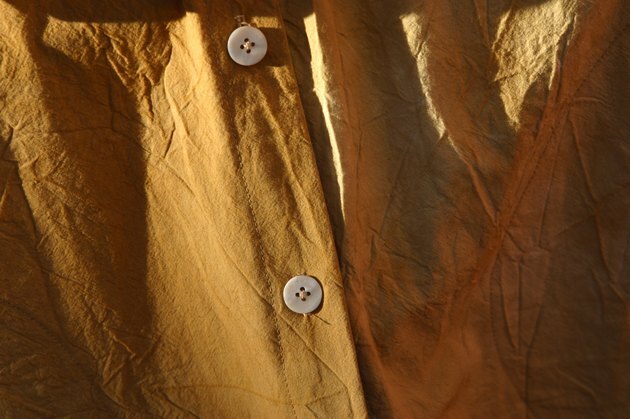 If your shirt is made from a blend, use the lowest heat setting associated with the materials. For example, if your item is 40 percent silk and 60 percent rayon, use the setting for silk. Lay the collar flat on your ironing board and spray it with water, or starch, depending on how severe the wrinkles are. Dress shirts will generally need starch. Wool coat collars should be sprayed with water, as starch will leave a film on the material. Place the heated iron at one end of the collar and smoothly run it over the surface of the collar. Repeat this step until all of the wrinkles have been removed. Flip the collar over and repeat with the opposite side. Flip the collar back into position and iron lightly along the crease. Spray both sides of the collar liberally with water. Place the item in a dryer with a dryer sheet and one or two clean towels. Set the dryer to its highest setting and tumble dry the item until it is completely dry and most of the wrinkles have been removed. Using a dryer will help unwrinkle most materials. You won't get a nice press or a crisp collar, but if you don't have any other option, it works well in a pinch. Adding towels to the dryer will help the garment tumble and dry.